A schematic of wave-particle duality? This Crop Circle appeared on July 13, 2011 at Windmill Hill. While studying this design it occurred to me that the pattern of motion which is clearly shown to us in this CC could represent a 2-D schematic which illustrates the inherent pattern of motion underlying the wave-particle duality of Sub-atomic particles (SAP’s). This duality has been experimentally documented as being a characteristic property of all SAP’s, such as electrons. It would seem as though this type of pattern, when viewed in a 3-D configuration, as it would be in “real life”, would demonstrate properties of both a particle and a wave and, at the speed of light, would appear to be both simultaneously. When the transition was made between spirals, the SAP would appear to be as a point particle, while in its spiralling phase would appear to be more like a wave with a characteristic amplitude and frequency. 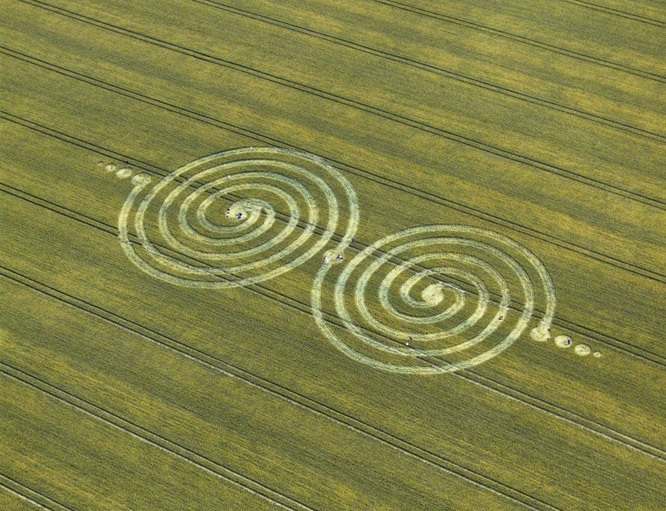 The crop circle design may be a very clever (too clever in my opinion) way of illustrating the pattern of motion required to demonstrate the enigmatic, yet clearly documented, wave-particle duality of SAP’s. I will leave it to the particle physicists to determine if such a pattern of motion could account for the various “spin states” (the various quantum numbers assigned to SAP’s), and whether or not such a configuration in 3-D space would necessarily conform to the Pauli Exclusion Principle. The infinity symbols leading into and out of the design speak for themselves.